By 2011, CoSort v9.5 was out as a major interim release expanding data source support to ODBC sources, UTF-16 and native multi-byte Asian character sets, big and little endian data at the file and field level, and more date and mainframe numeric data types. Perhaps the most exciting aspect of CoSort 9.5, however, is its new Graphical User Interface (GUI). The "IRI Workbench" is an Eclipse plug-in with wizards for job creation, metadata discovery and conversion, and job tuning. This visual, Integrated Development Environment (IDE) for all IRI products features purpose-driven, end-to-end job wizards, dialogs, and graphical components linked to a syntax-aware editor for scripting SortCL (and its metadata-compatible spin-off product) jobs. IRI Workbench supports database administration, version control, metadata management, job flow, reporting, and client/server execution capabilities designed for enterprise data management. In 2012, CoSort was shipping with more data warehousing and reporting features like pivoting, slowly-changing dimension and fuzzy logic lookups for discrete, trending, and windowed aggregate reporting. At the same time, the dramatic acceleration effects of SortCL's big data transformation capabilities, alongside ETL and BI tools like BOBJ, Cognos and Microstrategy, were reported. FACT-supported databases expanded beyond Oracle and DB2 to handle SQL Server, Sybase, MySQL, Altibase, and Tibero. In 2013, IRI was updating CoSort yet again for data architects, and releasing third-generation versions of FieldShield, RowGen, and FACT. A new NextForm package for native COBOL index file handling, database-to-database migration, unstructured data parsing, and expanded data source support followed in 2014. Between 2014 and 2015, IRI continued to demonstrate the impact CoSort has in preparing big data sets for analytics in tools like QlikView, R, Splunk, Spotfire, and Tableau. To bolster its offerings in data security, IRI also developed .NET and Java SDKs for FieldShield and RowGen, and groundbreaking CellShield technology to find and protect PII directly in Excel. These years are seeing even more rapid development and adoption of IRI software, including fourth and fifth-level releases of FieldShield for data masking and RowGen for test data management, and finally, CoSort version 10. Most notable however is the introduction and growth of IRI's new "total data management" platform, Voracity. 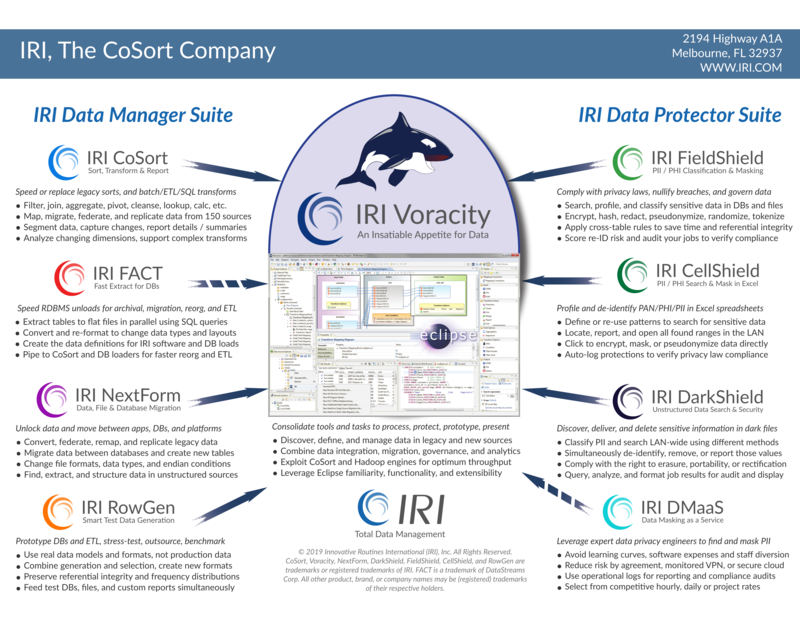 Powered by CoSort or interchangeable Hadoop engines, and the BI/DW industry's widest array of job design options, IRI Voracity combines data discovery, integration, migration, governance, and analytics in a single Eclipse pane of glass. Already an award-winning one-stop-shop for big data, Voracity is a game-changing solution stack with subscription pricing that bends megavendor and specialty provider cost curves. Voracity also brings big data ETL, data preparation, data governance, and information exchange to SMBs and enterprise CIOs who want a faster, easier and more affordable long-term platform to handle data as their needs evolve. In 2017, IRI began providing a market-leading database firewall called Chakra Max, for those who need faster, more affordable, high-traffic DAM/DAP and dynamic data masking (DDM). In 2018, the company's 40th year, IRI continued its rapid pace of innovation for Voracity and its subset product users ... to handle streaming and semi-structured data sources, more data masking and risk scoring features to FieldShield, and the discovery and masking of PII in unstructured sources in an all new product, DarkShield. Voracity was recently introduced to the BBBT community and is positioned in 2019 for new use cases requiring ETL, MDM, data governance, and "production analytics" while DBTA just named DarkShield a trend-setting product for 2019.